It's thirty years since Sting as singer and bass player with the world's biggest band, The Police, rocked Gateshead Stadium to its foundations. Last night, just down the road, at the Sage, a more reflective, intimate performance from the enigmatic star was equally electrifying. The milkman's son from Wallsend, now exiled in Tuscany, was launching the European leg of his Back to Bass tour, celebrating over 25 years of a successful solo career. He's already toured the States to rave reviews. Sting may have raised a few eyebrows over the years, what with his tantric shenanigans and carefully-publicised Third World concerns, but he remains the North East's biggest and best musical export – apart from Cheryl Cole, of course! After an introduction by none other than Jimmy Nail, the evening kicked off with 1991's 'All This Time' which, with its strong references to the Tyne, was written for Sting's father who'd recently died. Then it was back to days of peroxide blond hair and The Police with a bouncing 'Everything Little Thing She Does Is Magic'. Then thick and fast came the smooth complexity of 'Seven Days', the 80s punk of 'Demolition Man', and the country-tinged bitter-sweetness of 'I'm So Happy I Can't Stop Crying'. 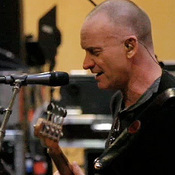 Sting has always surrounded himself with great musicians, not least in the drumming department. American session giant Vinnie Colaiuta is one of the best drummers on the planet, and last night he had no trouble nailing the hyperactive brilliance of The Police's Stewart Copeland, as well as the more grown-up, dynamic numbers like 'Fortress Around Your Heart'. Elsewhere, the father and son guitar team of Dominic and Rufus Miller, Northumberland lad Peter Tickell on mesmerising electric violin, and backing singer Jo Lawry, provided fantastic support to the main man, who still plays a mean bass guitar. The set progressed, highlighting Sting's song-writing mastery across a range of styles, whether it be the Police rocker 'Driven To Tears', the blues-infused 'Heavy Rain No Cloud', or the gentle country feel of the classic 'Fields Of Gold'. The singer seemed pleased to be back on home turf, revealing he’d been staying in Newcastle for the last week, and had enjoyed walking next to the Tyne with his daughter, venturing up the river as far as Elswick. Also it must be said, Mr Gordon Sumner is in fantastic nick for a 60-year-old Geordie bloke, with a better physique than most men 20 years his junior. And more importantly, Sting can still hit every note of every song. Impressive. And so the evening climaxed with the encores – the new-world vibe of 'Desert Rose', the inevitable 'Every Breath You Take' which featured Jimmy Nail, and the turbo-charged 'Next To You' from The Police's debut album. Until, last but not least, probably Sting's greatest creation, 'Message In A Bottle', played on his own, with an acoustic guitar. A magic moment at The Sage from a genuine superstar. A great night with a band of awesome musicians, and a charismatic singer-songwriter who’s lost none of his powers. While I was not there in body, my spirit surely was floating about. I am sure Sting simply enjoyed being home for the week, and then to perform, which he clearly loves to do....well....Just Perfect.